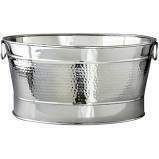 Stainless Steel Hammered Beverage Tub. Great for tabletop display or on the bar. Size: 20.5" x 14" x 9"
Square White China Bowl 9.5"